Sean Francis, owner of Kawartha Lakes Fit Body Boot Camp and Canadian Forces veteran of 18 years, raises funds to help replace tattered Canadian flags being flown in Oakwood. If we do not have pride in our country and flag, how can we have pride in ourselves? Sean Francis, also known as Corporal Francis, is a Canadian citizen and 18-year veteran of the Canadian Forces as well as the owner of Kawartha Lakes Fit Body Boot Camp. 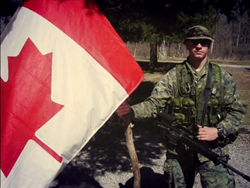 Corporal Francis recently asked the people of Canada to request torn Canadian flags be replaced or taken down, otherwise he’ll replace them himself using proceeds from his current boot camp program. Fit Body Boot Camp is the world’s fastest growing and most popular indoor fitness boot camp brand, with hundreds of locations worldwide. The boot camp’s unique brand of fitness combines individualized personal training from certified professionals, clinically proven Afterburn workouts, and nutritional guidance to guarantee weight loss results. Corporal Francis was driving through Oakwood, Ontario when he noticed that several of the Canadian flags being flown were in tattered disrepair. With a mission to help 10k residents reclaim their health and fitness, Sean believes that nationality ties in to the way Canadian residents view themselves. Friend Jamie Schmale who is a Member of Parliament for Haliburton, Kawartha Lakes and Brock joins him in his quest to replace the tattered flags. Corporal Francis has stated that if he needs to purchase the new flags himself then he will. He intends to use the proceeds from his current 21-Day Fat Loss Inferno program being run at Kawartha Lakes Fit Body Boot Camp. His goal is that people will support him in this endeavor and feel pride in their country’s flag again. Kawartha Lakes Fit Body Boot Camp is a part of the Fit Body Boot Camp family of indoor fitness boot camps, whose global goal is to engage 20% of the world’s population in a healthy and fit lifestyle by the year 2020. Kawartha Lakes Fit Body Boot Camp is owned and operated by Corporal Francis. Francis is committed to helping members of the Kawartha Lakes community set and accomplish their own health and fitness goals.